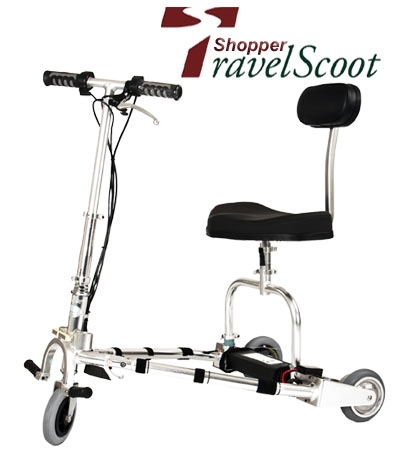 Product information "TRAVELSCOOT Shopper SET Li 151,2 Wh"
Ultralight mobilityscooter. For use on level ground and low thresholds. The Shopper is 30% lighter compared to the Deluxe/Standard, just over 26 lbs (12 kg). With the seat and battery removed, it weighs just 17.5 lbs (8 kg). Small wheels 6" (150 mm) x 1.2" (30 mm) and a small 100 watt hub motor for inclines max. 5%! Top speed ~2.3 mph (3.7 kmh), it is suitable for crowded environments such as shopping centers, pedestrian zones, fairs, museums and exhibitions. Top speed is limited to walking pace. For persons who either can't, shouldn't or do not wish to drive faster. Incl. bag, canvas, lightweight 151,2 Wh compact lithiumbattery 1,47 Kg for about 13 km, lithiumbatterycharger, toolkit, pu-tires. Related links to "TRAVELSCOOT Shopper SET Li 151,2 Wh"